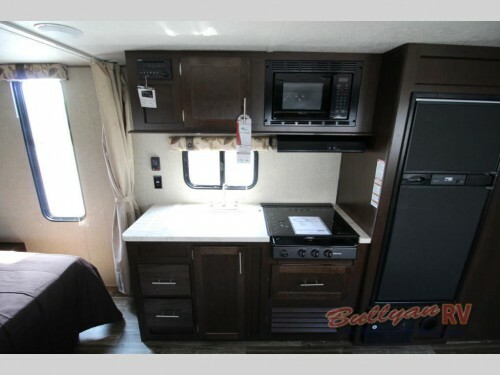 Take a look inside the Cherokee Grey Wolf 26CKSE travel trailer! With space to sleep up to nine people, the design of this RV lets you to bring along the whole family. Items like a set of double bunk beds and a long slide in the main area will provide a spacious interior and plenty of sleeping spaces for all. 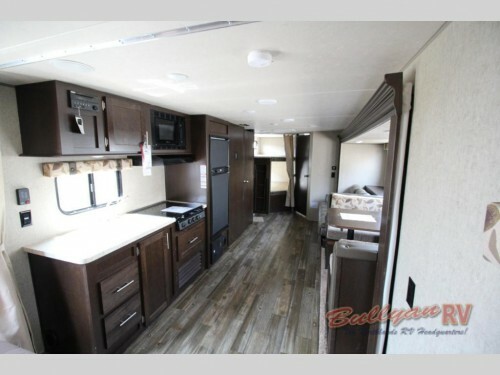 Check out the Cherokee Grey Wolf 26CKSE Travel Trailer! 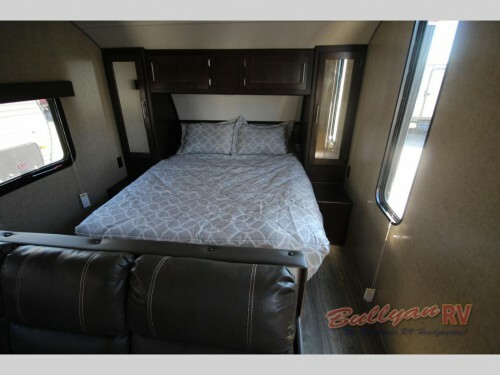 One way that this Grey Wolf 26CKSE is able to accommodate so many people is by having hidden and convertible furniture to add more beds. In the main room slide, for instance, you will find not only a convertible booth dinette and sofa, but there will also be another hidden bunk above the sofa. This out-of-the-way bed can be pulled down in the evening and put away easily in the daytime. Double bunks and one large slide adds more space for everyone. And for you, the master bedroom area at the front of the travel trailer will offer a comfortable and private place every night. Here you will find a queen bed as well as dual wardrobes for storing your belongings, and be sure to pull the curtain across to get the extra bit of privacy you need. A queen master bed provides easy rest. However, this Cherokee Grey Wolf floorplan is much more than just a place for your family to sleep. It also comes with other features and amenities to make camping more enjoyable. In the kitchen, you will find not only the standard appliances like a fridge, 3-burner range, and overhead microwave, but you will also have a large walk-in pantry for all of your dry goods and cooking ware. There will even be a mount for a television, so adding a TV will be a breeze. Feel at home in the kitchen with high quality appliances and ample storage space. The entire design of the Cherokee Grey Wolf 26CKSE is meant to make more room for the extra people in your life. 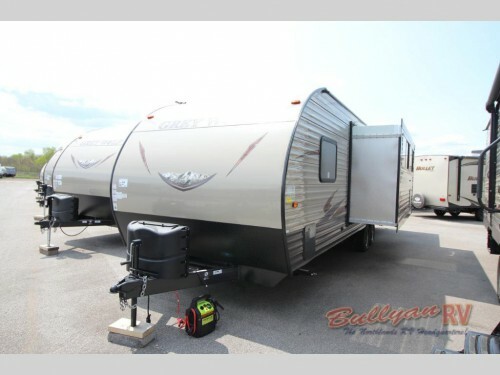 Whether you have a large family or like to bring along your friends, this travel trailer will have room. So be sure to contact us before you take your next RVing trip to learn more about this camper. Then, be sure to stop by our location and tow one home today!